Distribution: Zooplankton include such protozoans as the foraminiferans ; they are found at all depths but are more numerous near the surface. Bacteria are abundant in upper waters and in bottom deposits. 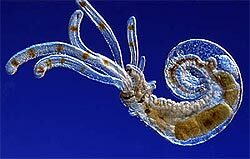 Description: Plankton is made up of tiny plants (called phytoplankton) and tiny animals (called zooplankton). The word plankton comes from the Greek word "planktos" which means "drifting." Zooplankton are floating or weakly swimming animals that rely on water currents to move any great distance. They are usually larger than phytoplankton, ranging from tiny copepods, less than a centimetre long, to jellyfishes and colonial salps that may be metres long. Zooplankton live off planktonic algae, bacteria, particles of dead organic material and other zooplankton. There are two major types of zooplankton: those that spend their entire lives as part of the plankton (called Holoplankton) and those that only spend a larval stage in the plankton realm. Important protozoan zooplankton groups include the foraminiferans, radiolarians and dinoflagellates . Important metazoan zooplankton include cnidarians such as jellyfish and the Portuguese Man o' War crustaceans such as copepods and krill,arrow worms, molluscs such as pteropods and chordates such as salps and juvenile fish.. 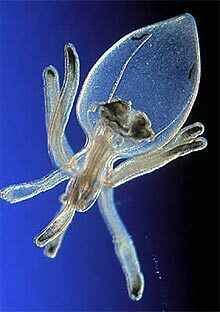 Many zooplankton are too small to be seen individually with the naked eye. Ecology: Plankton is the first link in the marine food chain; it is eaten by many organisms, including mussels, fish, birds, and mammals (for example, baleen whales). Zooplankton has a wide range in feeding behavior: filter feeding, predation and symbiosis with autotrophic phytoplankton as seen in corals. Zooplankton feed on bacterioplankton, phytoplankton, other zooplankton (sometimes cannibalistically), detritus (or marine snow) and even nektonic organisms. As a result, zooplankton are primarily found in surface waters where food resources (phytoplankton or other zooplankton) are most abundant. Interesting facts/Status: Interesting facts Apart from bacteria, planktonic organisms are the most abundant life form on earth.Aside from this role in aquatic food webs, zooplankton can also act as an important disease reservoir. They have been found to house the bacterium Vibrio cholerae, causative agent of cholera, by allowing the cholera vibrios to attach to their chitinous exoskeletons. This symbiotic relationship greatly enhances the bacterium's ability to survive in an aquatic environment, as the exoskeleton provides the bacterium with an abundant source of carbon and nitrogen. Status: Monitoring of change at the marine planktonic level is difficult and expensive. Like all the other marine life that have calcium carbonate shells many zooplankton species will be sensitive to dissolution in acidic waters. A southward movement of tropical and temperate species is predicated as the ocean waters warm and changes in abundance of particular species with flow on effects to the prey and predators has very real consequences for the oceanic food web.